Nativa en Colombia; Alt. 80 - 650 m.; Amazonia. Hevea guianensis var. lutea (Spruce ex Benth.) Ducke & R.E.Schult. Siphonanthus elasticus Schreb. ex Baill. Siphonia cahuchu Rich. ex Willd. Siphonia guianensis (Aubl.) Juss. ex Baill. Sam, H.V. & Van Welzen, P.C. (2004). 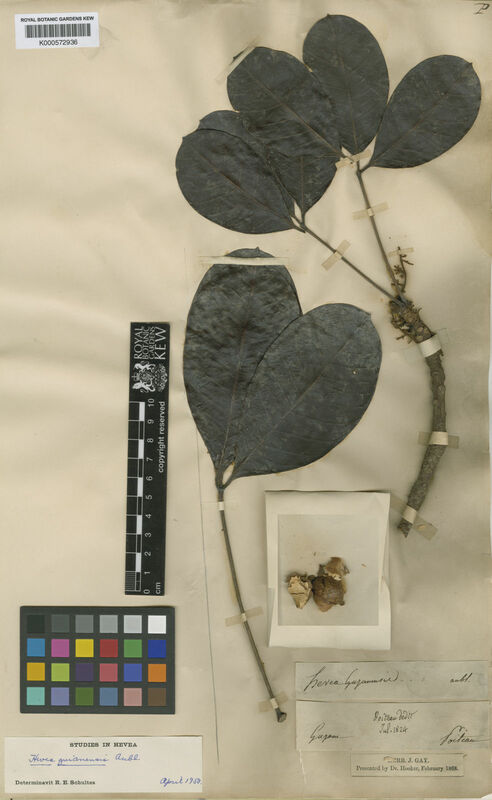 Revision of Annesijoa, Elateriospermum and the Introduced species of Hevea in Malesia (Euphorbiaceae) Blumea 49: 425-440.